Friday, Friday, Friday, so happy to see you! Let's get right to it -- here is my Five On Friday this lovely day. 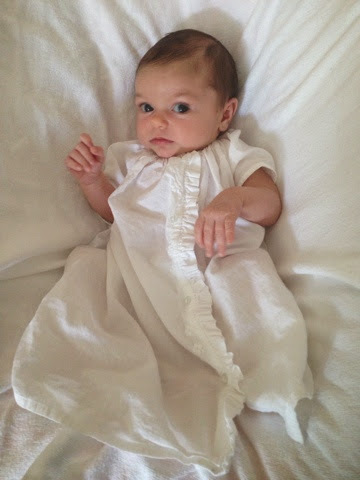 This week our babe turned four weeks old -- and her official one month birthday is Saturday! My, how time flies. I will be sharing her birth story and a one-month update soon! She is definitely getting bigger and her little personality is getting stronger and stronger every day. I'm nearly out of my Josie Maran Argan Oil Light (I started with the small version at $16). I will definitely be purchasing a new one of these! I use it as a facial moisturizer each night after washing my face. I put a drop on my forehead and a drop on each cheekbone and then rub it in. It's also great for hair flyaways. You can get the light version or the normal version at Sephora and I would definitely recommend starting with this small $16 version to see if you like it. It's also way easier than justifying $48 for the normal size! Have you seen this "I'm So Pregnant" spoof on the Iggy Azalea song Fancy? HILARIOUS. We had such an awesome trip to the mountains this past weekend, and it included a very important stop to visit Ian's dad. A truly special moment. We know he'd be crazy about Camille. This weekend I've got a much-needed GIRLS NIGHT on the books for Saturday evening! Operation "find something cute that fits" is officially on. I'm so excited that Camille has been a total rockstar on taking a bottle (we introduced it Wednesday at 4 weeks) so that I can scoot out of the house for more than an hour or two at a time! Camille is so cute! Enjoy your girls night! Oh my that photo at Ian's dad grave gave me goosebumps. Definitey special moment. She is beautiful. She is a DOLL in that first picture! OMG! Love that picture of Ian and Camille at the grave. How special indeed, especially since we're coming up on Father's Day. A month already eh?! so crazy! Have a great weekend! them being able to take a bottle is a game changer mama...you're going to have a great time on your night out!!! your little girl is so so darling! hope you and your little family are doing well!! Camille gets more beautiful with every picture you post of her - just like her momma! 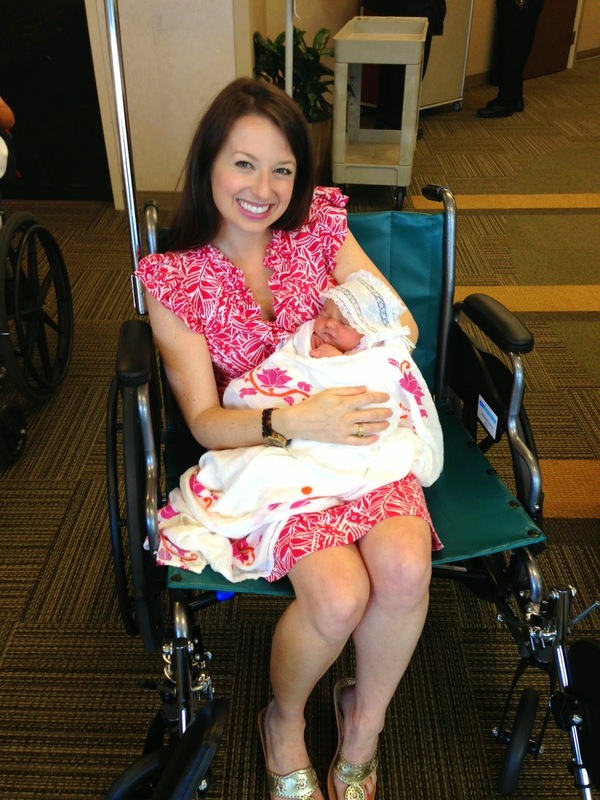 Seriously, you look amazing in that leaving the hospital photo! What a special moment to take her to where Ian's dad is in the mountains. Wow, the grave site picture is so wonderful. It'll certainly be a pilgrimage of ours when we have little ones someday. She is so beautiful! Love the picture of her in the white gown. Girl, you don't look like you are leaving the hospital because you just had a baby. You look gorgeous! As always, Camille is precious! Camille is just so beautiful! And you, mama, are a beauty queen right out of the hospital!! I looked quite the opposite ;) I love that Argan oil too - so good! Have the best weekend! Camille is so cute and getting so big already!! Enjoy your girl's night out. The time with Ian's late father is so beautiful. What a special moment. I've been wanting to see that video - hilarious! Happy 4 weeks to your sweet adorable baby girl!!! I'm a huge josie maran argan oil fan and I've always used the regular but may try the light next time!! Camille is adorable...I can't believe my Farrah is 5 weeks today. It flies so fast! Glad to hear she is doing well! Camille is adorable! Happy 4 week bday to her and hooray for Girls' Nights out. They're definitely needed. Hope you have a lot of fun! How very special you were able to go to John's dad's resting place right before Father's Day. That must have been a very sentimental moment. Camille is so cute and I cannot believe already one month!! I feel like I was just anxiously awaiting news via Instagram!! That is so sweet and special that Camille got to meet Ian's dad. I got to "meet" Cameron's dad and brother when his grandmother passed away. Happy and sad all at the same time. Happy Friday and Happy 1 month to your adorable baby! 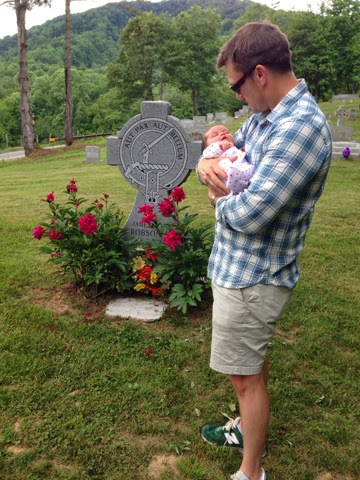 Taking baby Camille to visit his grandfather was very sweet! how is she already one month?!? that doesn't even seem possible! Camille is beautiful. BEAUTIFUL!!! What else can I say.BEAUTIFUL! Camille is so beautiful! I know you are enjoying every moment. Have a wonderful time out with the girls tonight - I'm sure Ian will have a special time as well! Happy Friday! (well Sunday now...haha). Hope you had an amazing weekend and am even more amazing girls night out!! she is just adorable! Monthdate's are my favorite!